The morning of April 21, 2012, the family of Isabel Celis awoke to find her missing from her bedroom. Within hours her neighborhood was blocked off and hundreds of law enforcement and search personnel canvassed the area. After the family went door to door asking for assistance, Nathan McDonald (a neighbor living three houses down from the Celis family) responded by searching a nearby wash. Despite the efforts of volunteers, family and law enforcement, Isabel Celis remains missing. In late May, 2012, Tucson Police Department released approximately 550 documents to the public. Primarily the documents appeared to be tid bits of information inconsequential to the ongoing investigation. Mr. McDonald (along with most of the Celis family neighbors) was mentioned numerous times. Included in the documents was the report of a first responding officer, describing a conversation with Mr. McDonald as he returned to his vehicle that morning, having finished searching the nearby wash. Shortly after the release of the documents, BlinkonCrime.com published an article and interview. While a cursory review of some information from the document dump, the interview and article also focused on Nathan McDonald, linking to his Facebook and describing a "compelling schematic" for his involvement in the abduction. Within a short time period, the internet had circulated Mr. McDonald's name as a suspicious person in the abduction of Isabel Celis, based solely on the misrepresentations and insinuation of Christina Stoy and her public comments section. McDonald himself began defending himself within the comments section of BlinkOnCrime.com. McDonald's primary complaint was that Stoy had several facts incorrect. After offering to remove or correct any substantiated mistakes, Stoy has yet to correct her errors. 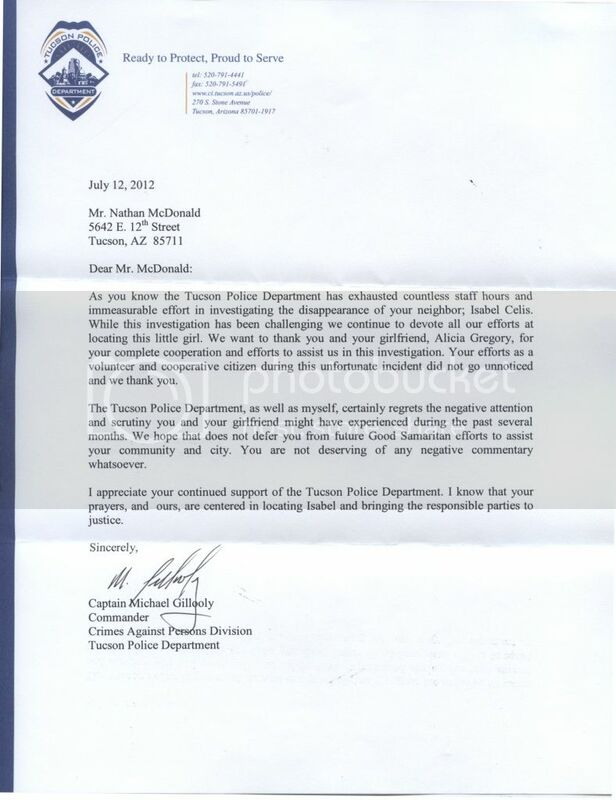 Along with correcting the libel of Stoy, McDonald presented her with a letter from the Tucson Police Department, which he says was a direct response to her article. One year later, Stoy has yet to correct her mistakes and has yet to publish the letter from TPD. Having used misrepresentations of public record to slander Mr. McDonald and insinuate a connection to the abduction of Isabel Celis, she remains unwilling to retract her libel. Originally, Stoy had presented her article as a two piece article. After McDonald showed up in her comments section defending himself and calling her out for her libel, Stoy never published part two. On her site still is the promise of the second part, with the enticement "There are suspects". That is breaking information, as investigators have released no information about suspects.